The 59th Annual Grammy Awards Ceremony, the biggest event of music calendar, was held on February 12, 2017 in Los Angeles. Except the big winners and nominations of the records, albums, songs, artists of the year, there are great moments worthy of being remembered, like Beyoncé Performs "Love Drought” and “Sand Castles". You probably want to download these Winner or Nomination songs, albums, and great shows, performances or moments on this biggest music ceremony for offline enjoy. This article will share the full list of the 59th Annual Grammy Award and the way on how to free download these great music, performance and the full show of this grand Ceremony. Any Video Converter Freeware is such a free powerful Grammy Award video or music Downloader, with which you can free download any 2017 Grammy Award video or music to PC, iPhone, iPad, Android devices, etc in 4K/HD MP4 format. Please download and install this free Grammy Award video or music Downloader first in order to download and play 2017 Grammy Award on your devices offline. Hello is song by English singer Adele and released on 23 October 2015. As the lead single of Adele's third studio album, 25, it reached number one in almost every country it charted in and had the largest opening week sales in three years. 25, the third studio album by English singer Adele, was released on 20 November 2015. It received generally positive reviews from music critics. The album won massive commercial success, debuting at number one in more than 25 markets and broke first-week sales records in multiple countries. Step 1: Go to YouTube/Dailymotion/Vimeo or other 100+ sites and search for the 59th Annual Grammy Awards, the songs of Adele or other nominations, copy the video or music URL(s) from those sites. Click on the Add URLs button, and a dialog will pop up, just click plus icon, and paste the download link to it. You can continue to paste more links as the previous steps. 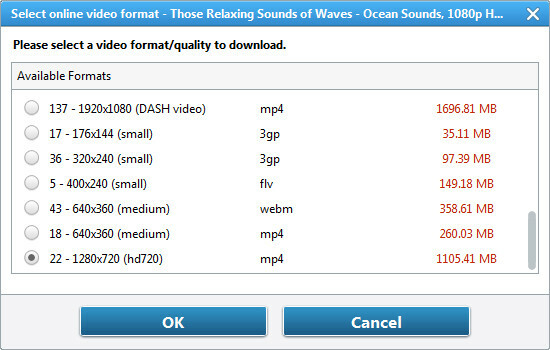 Note: Before downloading videos or music, press Online Video Tab, then simply choose Manually Select under Select Format thus you can choose the video format such as HD, MP4 etc. that you need when downloading. Step 2: After choosing the video format you want, press Start Download button and click "OK" to start downloading those Songs, Performances or Shows of the 59th Annual Grammy Awards on your computer and transfer them to Android, iPhone, iPad or other portable devices for offline enjoy. After 2017 Grammy Awards Shows, perforamces, music were downloaded to the computer. you can enjoy Grammy videos or music offline or transfer them to your portable devices like iPhone/iPad/Android phones so that you can watch videos or listen to the music offline anytime and anywhere.